During my early years at Yonder, I was curious how to setup a startup and create a successful product that really solves a problem. I got intrigued by the companies in Yonder’s portfolio, whether they were organizations with mature platforms who deal with customers on a daily basis or startups in the first stages of their life cycle. Such questions like “How can we solve a real problem? “, “How prepared is the market?”, “Am I investing too much?”, “How I can validate the idea behind a startup?”, were on my mind. Having navigated through several books on the subject, I got most of the answers from ‘The Lean Startup’ by Eric Ries. At Yonder we had started an initiative internally called the Yonder Book Club, where we come together and discuss inspirational topics related to our type of business and how to apply these insights in our day-to-day work. We also wanted to share the insights with our customers as these can be really valuable to them. And so, the Yonder Book Club has taken a new shape and we are stepping out into the world so we can share our insights with you. 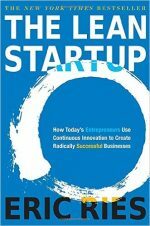 ‘The Lean Startup’ is one of the books we discussed early on and the principles that the author Eric Ries presents are much used. He provides a toolkit on how to deal with startups, new initiatives and also how to develop successful products. It is a toolkit that can be used by you as an individual, a startup or a mature business. Startups are not just for tech geeks nor do they have to start in a garage. “A startup is a human institution designed to create a new product or service under the conditions of extreme uncertainty”. In other words, it’s not about whether you are a company (big or small, decentralized or corporate) or an entrepreneurial individual. It’s about having a vision that you want to develop into a product or service which will bring added value to the ecosystem of your customers. And it is about you reaching that goal. I believe that it’s easier to create a startup from inside a company rather than starting one from your garage by yourself which rarely succeeds (with the one exception we all know.) Starting it inside a company gives you more insights into the market, the customers, and their challenges, making it easier for you to find out how can you solve these. When you try to create an autonomous division in a company that will be responsible for a new product/new initiative (the name for a startup in an existing company) then the main concern or biggest pitfall is having too much structure; meaning having to focus on procedures and financials of a mature division. So the best option is to isolate the new startup division from the standard corporate structure and run it as if you were a traditional startup while profiting from the mature business experience. Having unique ideas is pretty difficult in today’s technological context. I have seen many entrepreneurs that kept the idea, strategy, and product a secret. This too often resulted in a product with a long development period, very rich in features, and consequently a large investment sum. By the time it was released it was outdated and did not address real or current customer challenges. Having a unique idea might give you the chance to produce a disruptive innovation, but without true validation, you could be addressing a nonexistent market or need, or the wrong customer segment. Having a “not-so-unique” idea gives you the opportunity to share it with a select prospect base, confirm whether it addresses the need and give you insights into the complexity of entering the market. Therefore, it is important to know what your customers want and what will solve some of their challenges. If we’re talking about knowing your customers, the most important aspect is to know how to segment them based on the adoption rate of new technologies and products. In the beginning, you need those customers that will give you feedback and help you pivot your idea in the right direction: solving a problem and addressing a need. You are looking for “The early adopters”, those prospective customers who are open to new and innovative products, who want to be the first in the market and are looking to gain a competitive advantage through new solutions. They will be your first customers and give you the most feedback. And last but not least, early adaptors quite happily accept an MVP (Minimum Viable Product) as long as long as they are the first in the market to use it. They will also be the ones that will imagine how the solution will fit their needs and they will give you much more insights. Other questions about your customers that you need to know, and which are crucial to the success of the solution, is if they are willing to pay for it and if this satisfies your assumptions. So now you know who your early adopters are, do not invest yet but try to get them to participate in developing the solution. You feel great that everybody is interested in your solution, but are they willing to pay for it? How many of them are they willing to pay upfront, or rather co-invest in the solution? In the book, Eric Ries gives you examples on how to get your customers to commit upfront before you actually invest in building your solution. So try to minimize your investment before receiving your clients’ commitment. To get them on board and convince them to commit, you can create illustrations or mockups of your idea, or you can use other methods to prove it. The Lean Startup proposes new ways of iterations for the building phase of your product, and the main accent lies on validated learning. Validated learning is a technique by which you get feedback from your customers on your proposed solution. Validated learning will help you in creating a product that your customers actually need. The process is different from traditional iterations through building milestones and the accent is placed on the validation of your assumptions and not on the quality or quantity. This means that you will start with ideas, or better said, with assumptions of how you can solve a problem. Then you invest a minimum amount of resources in creating an illustration of a proposed solution. Then comes the validation moment when the solution is placed in front of the customers who will assess it, give input, make adjustments and generate new ideas on how you can pivot your product to address their real needs. Is my solution adding value to my customers? Can I extend my solution from early adopters to the mass market? An MVP, or Minimum Viable Product, is a way to eliminate as much waste as possible. This is the first iteration of your solution and usually, is based on non-validated assumptions. So it’s subject to change in the future through learning cycles. The MVP should be as the name suggest, the minimum product that is viable enough to be your solution. The goal of the MVP is to test the fundamental business hypothesis and it shouldn’t be the subject of product design or technical excellence. Traditionally you measure your results through KPIs in terms of quality and quantity. Based on the Eric Ries’ method you should measure other KPI’s than the traditional success factors. Are you interested in finding out more about ‘The Lean Startup’? Interested on how Yonder applies these learnings in our engagements with our customers? Then let us know and we will discuss it in more detail and bring (or send) you a copy of Eric Ries’s ‘The Lean Startup’. Just use the contact button on the right. Note: this offer only applies to ISVs or enterprises who serve their internal customers as a software product company would. All other requests will not be honored. WANT TO KNOW HOW THIS COULD APPLY TO YOUR COMPANY? Contact us and someone will visit you with a copy of the book to discuss the applicability for your product and company.